Up to 10,000 people, most of them Kosovo Serbs, have gathered in front of the U.S. Embassy in Belgrade. 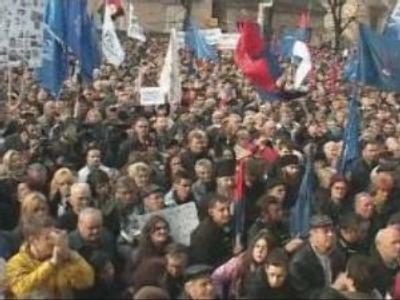 It was the biggest protest rally the Serbian capital has seen in the last couple of years. They came to voice their views on the status of the breakaway province. A position, which hasn't changed since the first calls for independence were heard from Kosovo's Albanians. “Brothers and sisters, Kosovo must remain as a part of Serbia. The Jews waited, and today they are in Jerusalem. So, we will wait to get Kosovo back,” a famous Serbian writer, Sinisa Kovacevic, addressed the crowd. Less than a month ago UN special Kosovo Envoy Martti Ahtisaari brought his settlement proposals to both Belgrade and Pristina. According to the plan, Kosovo is to gain self-rule, supervised by international forces. It also provided that the region could enter international organizations and also have its own anthem and a flag. And that was something seen as unacceptable by Serbs, who rejected the plan for, as President Boris Tadich said, “paving way for Kosovo's independence”. Official Pristina supported the proposals. But a radical Albanian movement “self-determination” didn’t. Their rally in Pristina on the February 10 was dispersed by the police, sparking violence which left two killed. But there was no violence in Belgrade. People chanted patriotic slogans, holding banners. “Russia has the power of veto to block Kosovo's independence, should the UN Security Council say that it must become independent. And I hope that it will block such a decision, because so far we've heard Russia supporting our position,” said one of the protesters, Predrag Markovic. After negotiations between all the sides involved come to an end, which is expected to happen on March 10, Marti Ahtisaari will bring his final verdict to the UN Security Council. That is where the fate of the province will be decided. But meanwhile, impatience is growing. With just weeks left before the Kosovo issue will be taken to the UN Security Council such protests will intensify. On Saturday, the radical Albanians will gather in Kosovo's capital Pristina for another rally. And that is where security measures will be stepped up.